Learn Chinese quickly and easily with 100 downloadable mp3 files. The audio trainer book2 is free and contains 100 lessons that provide beginners with the basic vocabulary. Listen to book2 on your mp3 player anywhere! You will be able to fluently speak short sentences in Chinese in real-world situations in no time. The book2 method (www.book2.de) successfully combines audio and text for effective language learning. Learn Georgian quickly and easily with 100 downloadable mp3 files. The audio trainer book2 is free and contains 100 lessons that provide beginners with the basic vocabulary. Listen to book2 on your mp3 player anywhere! You will be able to fluently speak short sentences in Georgian in real-world situations in no time. The book2 method (www.book2.de) successfully combines audio and text for effective language learning. Learn Dutch quickly and easily with 100 downloadable mp3 files. The audio trainer book2 is free and contains 100 lessons that provide beginners with the basic vocabulary. Listen to book2 on your mp3 player anywhere! You will be able to fluently speak short sentences in Dutch in real-world situations in no time. The book2 method (www.book2.de) successfully combines audio and text for effective language learning. Learn Russian quickly and easily with 100 downloadable mp3 files. The audio trainer book2 is free and contains 100 lessons that provide beginners with the basic vocabulary. Listen to book2 on your mp3 player anywhere! You will be able to fluently speak short sentences in Russian in real-world situations in no time. The book2 method (www.book2.de) successfully combines audio and text for effective language learning. Learn French quickly and easily with 100 downloadable mp3 files. The audio trainer book2 is free and contains 100 lessons that provide beginners with the basic vocabulary. Listen to book2 on your mp3 player anywhere! You will be able to fluently speak short sentences in French in real-world situations in no time. The book2 method (www.book2.de) successfully combines audio and text for effective language learning. Learn English quickly and easily with 100 downloadable mp3 files. The audio trainer book2 is free and contains 100 lessons that provide beginners with the basic vocabulary. Listen to book2 on your mp3 player anywhere! You will be able to fluently speak short sentences in English in real-world situations in no time. The book2 method (www.book2.de) successfully combines audio and text for effective language learning. Learn German quickly and easily with 100 downloadable mp3 files. The audio trainer book2 is free and contains 100 lessons that provide beginners with the basic vocabulary. Listen to book2 on your mp3 player anywhere! You will be able to fluently speak short sentences in German in real-world situations in no time. 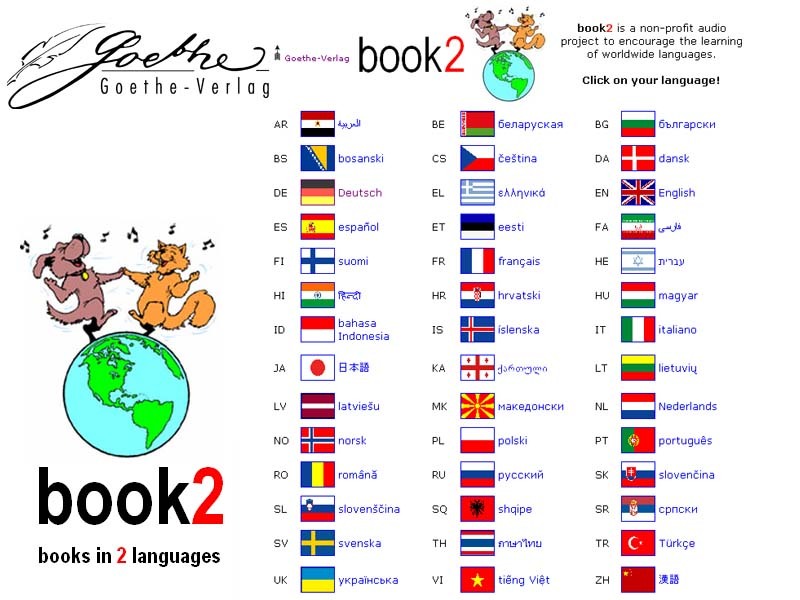 The book2 method (www.book2.de) successfully combines audio and text for effective language learning.